Before you ask, nope, we’re not sick of writing, thinking, or thinking about writing about coffee or breakfast, just yet. We’re not even sure that’s a possibility. 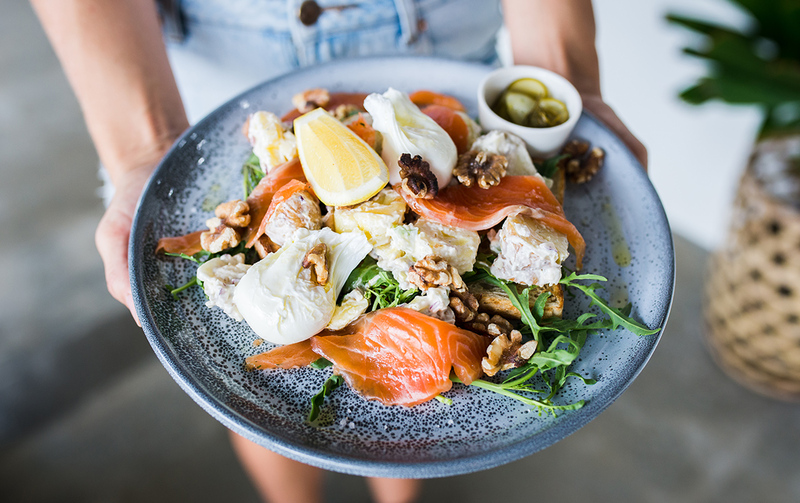 When there’s just so many damn good cafes opening up across the Coast, what’s one to do except cover and present them to our fave brekkie junkies, AKA allll of you. And so here we are, another week and another list of new cafes to add to your hit list. Go forth and conquer! A recent addition to Tweed’s busy Kennedy Drive thoroughfare, this diamond in the semi industrial rough is what immediate locals have long been craving. For the rest of us, a short jaunt across the border is totally worth it for this hip corner cafe with raw industrial vibes, a whimsical feature flower arrangement by Gather Store, personalised service and some of the best new breakfasts we’ve devoured this year. Start with Hymn’s smooth caffeinated brew using Melbourne’s St Ali beans or an Insta-worthy Mermaid Latte by local supplier Nutra Organics. Before moving onto the egg and bacon Hawker Roll with roti, apple sauce and house made condensed milk mayo or the nek-level Here Fishy Fishy with gin-cured salmon, potato salad, walnuts and poachies. Yep, you’re going to love this southern gem. Given the vast populous of the northern end, cool cafes are surprisingly few and far between. Which is why our ears perked right up when a little birdy told us about Sanctuary Cove newbie, Pier B Wholefood Cafe. We’re lusting over the Insta-worthy seating nooks with breezy Hamptons vibes and layered natural textures. Perfectly complemented by a simple yet health-conscious menu featuring house made raw treats, Snickers smoothie bowls, acai, fresh juices, activated charcoal lattes, All Press coffee and take away granola jars. Having deservedly earned a loyal following on the southern end, with their four-year-old hole-in-the-wall cafe on Coolangatta’s Marine Parade, The Black Sheep Espresso Baa have quietly opened the doors in a somewhat tucked away new posi in the Currumbin industrial estate. Next to Zipang (immediate locals will know the spot), come for the Open House Coffee Roasters cuppa joes and an impressive breakfast and lunch menu (we’ve got our eyes on ‘The Michael’ named after a customer that ordered all the sides on one plate). So much more than just a cafe, this team has always been about #givingback so keep an eye out for some heart-warming initiatives on the horizon. While we know it’s hard going past all the other coffee gems in Currumbin (there are plenty of them! ), we can vouch this newbie is a quality addition to the neighbourhood. So new it's only a few weeks old, think: minimalist industrial interiors, raw hanging globe fixtures, exposed cooper piping and a hand-etched mandala world map on the wall, Quade and Co. is definitely worth a lookee. Finding its home in a tired Miami retail complex, this could just be the new injection of energy this highway-side precinct needs. Expect Locale Espresso beans pouring, easy bites including toasties, muffins and doughnuts; with a brekkie menu, after-hours workshops and community-led events to follow a little later in the year. Love hunting down newbies? We’ve tracked down 18 Gold Coast breakfasts to try in 2018.